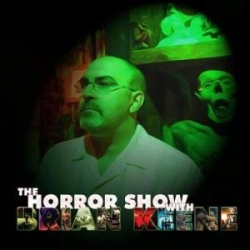 THE HORROR SHOW WITH BRIAN KEENE is a weekly podcast hosted by best-selling writer Brian Keene and musician, animation and video game veteran Dave Thomas. Each week, Brian, Dave, and their occasional co-hosts (authors Geoff Cooper and Mary SanGiovanni, director Mike Lombardo, the bubbly Phoebe, and nine-year-old Dungeonmaster 77.1) discuss the latest news in horror fiction, films, comic books, games, and more, along with in-depth interviews with horror’s biggest names, historical perspectives on the genre, and much more. THE HORROR SHOW WITH BRIAN KEENE is a weekly podcast hosted by best-selling writer Brian Keene and musician, animation and video game veteran Dave Thomas. Each week, Brian, Dave, and their occasional co-hosts authors Geoff Cooper and Mary SanGiovanni, director Mike Lombardo, the bubbly Phoebe, and nine-year-old Dungeonmaster 77.1 - discuss the latest news in horror fiction, films, comic books, games, and more, along with in-depth interviews with horror's biggest names, historical perspectives on the genre, and much more.